The Urticaceae /ɜːrtɪˈkeɪsiː/ are a family, the nettle family, of flowering plants. The family name comes from the genus Urtica. 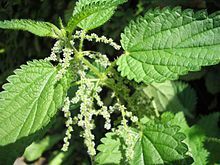 The Urticaceae include a number of well-known and useful plants, including nettles in the genus Urtica, ramie (Boehmeria nivea), māmaki (Pipturus albidus), and ajlai (Debregeasia saeneb). The family includes about 2625 species, grouped into 53 genera according to the database of the Royal Botanic Gardens, Kew and Christenhusz and Byng (2016). The largest genera are Pilea (500 to 715 species), Elatostema (300 species), Urtica (80 species), and Cecropia (75 species). Cecropia contains many myrmecophytes. Urticaceae species can be found worldwide, apart from the polar regions. Urticaceae species can be shrubs (e.g. Pilea), lianas, herbs (e.g. Urtica, Parietaria), or, rarely, trees (Dendrocnide, Cecropia). Their leaves are usually entire and bear stipules. Urticating (stinging) hairs are often present. They have usually unisexual flowers and can be both monoecious or dioecious. They are wind-pollinated. Most disperse their pollen when the stamens are mature and their filaments straighten explosively, a peculiar and conspicuously specialised mechanism. The APG II system puts the Urticaceae in the order Rosales, while older systems consider them part of the Urticales, along with Ulmaceae, Moraceae, and Cannabaceae. APG still considers "old" Urticales a monophyletic group, but does not recognise it as an order on its own. The fossil record of Urticaceae is scattered and mostly based on dispersed fruits. Twelve species based on fossil achenes are known from the Late Cretaceous of Central Europe. Most were assigned to the extant genera Boehmeria (three species), Debregeasia (one species) and Pouzolzia (three species), while three species were assigned to the extinct genus Urticoidea. A Colombian fossil flora of the Maastrichtian stage has yielded leaves that resemble leaves of the tribe Ceropieae. ^ Germplasm Resources Information Network (GRIN) (2003-01-17). "Family: Urticaceae Juss., nom. cons". Taxonomy for Plants. USDA, ARS, National Genetic Resources Program, National Germplasm Resources Laboratory, Beltsville, Maryland. Retrieved 2008-04-24. ^ Chomicki G, Renner SS. (2015). "Phylogenetics and molecular clocks reveal the repeated evolution of ant-plants after the late Miocene in Africa and the early Miocene in Australasia and the Neotropics". New Phytologist. 207 (2): 411–424. doi:10.1111/nph.13271. PMID 25616013. ^ Datwyler SL, Weiblen G. (2004). "On the origin of the fig: Phylogenetic relationships of Moraceae from ndhF sequences". American Journal of Botany. 91 (5): 767–777. doi:10.3732/ajb.91.5.767. PMID 21653431. ^ Monro AK. (2006). "The revision of species-rich genera: A phylogenetic framework for the strategic revision of Pilea (Urticaceae) based on cpDNA, nrDNA, and morphology". American Journal of Botany. 93 (3): 426–441. doi:10.3732/ajb.93.3.426. PMID 21646202. ^ Conn BJ, Hadiah JT (2009). "Nomenclature of tribes within the Urticaceae". Kew Bulletin. 64 (2): 349–352. doi:10.1007/s12225-009-9108-4. JSTOR 20649663. ^ "Common Names of Plant Diseases: Diseases of Foliage Plants (House Plants): Urticaceae". The American Phytopathological Society. 26 March 1993. Archived from the original on 30 November 2011. ^ Chase, A. R. (1983). "Influence of host plant and isolate source on Myrothecium leaf spot of foliage plants" (PDF). Plant Disease. 67 (6): 668–671. doi:10.1094/PD-67-668. Pignatti, Sandro (1982). Flora d'Italia (in Italian). Bologna: Edagricole. ISBN 978-88-506-2449-2. Friis, Ib (1989). Urticaceae. Flora of tropical East Africa. Rotterdam: A.A. Balkema and the Royal Botanic Gardens, Kew. ISBN 978-90-6191-352-8. Wikimedia Commons has media related to Urticaceae. Stevens, P. F. "Angiosperm Phylogeny Website, Version 13". Missouri Botanical Garden. continuously updated.